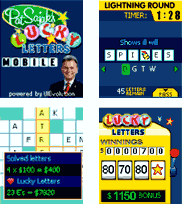 Can you beat Pat Sajak at his own game? There's plenty of brain-tickling excitement for your mobile phone in this game that combines the excitement of a game show with the challenge of a word puzzle. Fun for all ages, but still challenging enough for any adult. Spin the slots to determine dollar values for each clue. Spot the Lucky Letter in each answer. Complete the answer using the letters shown on the screen. Solve each word and the Lucky Letter spreads throughout the puzzle. Play ten clues to solve most of the puzzle. Wager some or all of your winnings in a Lucky Chance round. Race against the clock to finish the puzzle in the Lightning Round.